Universal Verification Methodology (UVM) is the industry standard verification methodology for Verification using SystemVerilog (SV). UVM provides means of doing verification in a well-defined and structured way. It is a culmination of well-known ideas, thoughts and best practices. Given the major adoption of UVM across the globe and across the industry, advanced users are looking for tips and tricks to improve their productivity. UVM does define a structured framework for building complex testbenches. It is built on strong OOP principles and design patterns using underlying SystemVerilog language features. This strong OOP nature presents certain challenges to the end users. Recall that many Design-Verification (DV) engineers come from hardware, electronics backgrounds and not heavy Software backgrounds. Hence at times it gets tricky for users to debug UVM based testbenches when things do not work as expected. In this article the authors share their long experience of assisting customers with run time debug of common UVM issues and potential solutions to them. During our various training and consulting engagements using UVM we have seen DV engineers struggling to debug relatively simple UVM issues. It will be unfair to blame the users as many a times, the error messages are cryptic and do not point to the actual source code, rather somewhere from the base classes, making the debug difficult. We have captured a series of such common issues and error messages into a collateral form that we call "UVM Vault". As part of our QVP engagement with Mentor Graphics, we are integrating this UVM Vault to Questa® in the near future. Specifically, we will highlight a few hand-picked features in the UVM factory and provide tips and tricks around them. It is expected that the readers are conversant with the UVM framework to appreciate the tips presented below. In class-based programming, the factory method pattern is a creational pattern that uses factory methods to deal with the problem of creating objects without having to specify the exact class of the object that will be created. This is done by creating objects by calling a factory method rather than by calling a constructor. Steps 1 & 2 above are to be done while a verification environment is being created by the developers. Once such a good framework is ready, verification engineers and VIP users can use step 3 above to tweak the behavior of underlying components and transactions. Below is a sample log with a transaction named s2p_xactn. A sample run with Questa shows a log as shown below in Figure 3. TIP: Look at the "Type" column in standard UVM print (uvm_object::sprint) to see if your override indeed worked! If not, no need of waveforms to debug, go back to your UVM code! There are cases when multiple overrides are set on the same object. There are use cases to "ignore" such overrides and then other situations where-in it is desired to "replace". UVM's factory override mechanism supports both requirements. 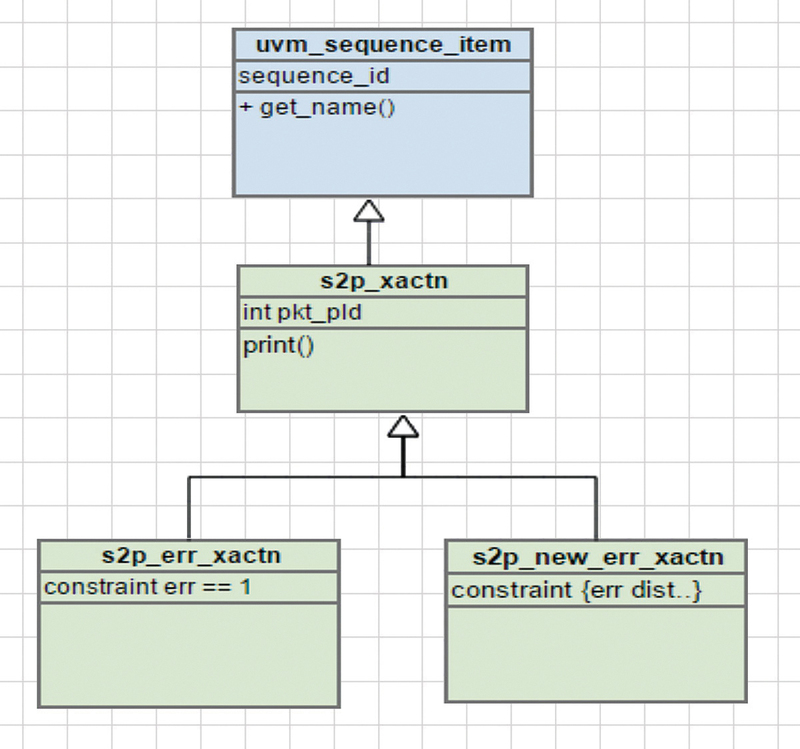 Consider a transaction model derived as shown in Figure 4, there are two similar error transactions derived from a base s2p_xactn. Now if two overrides are specified for the same s2p_xactn (assume that's the transaction on which driver, sequencer etc. 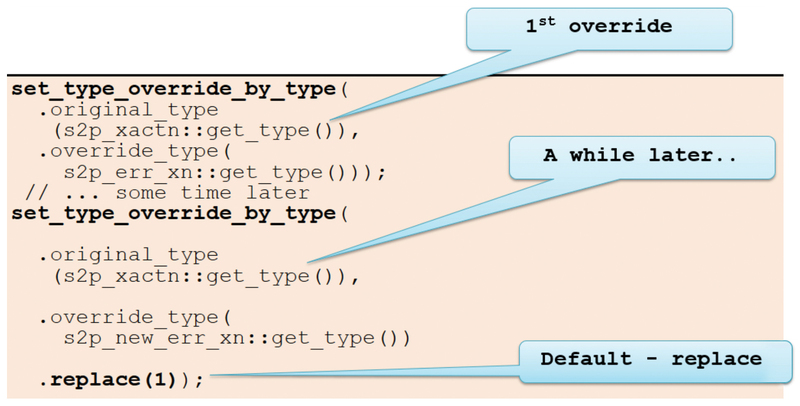 are parameterized), code snippet in Figure 5 shows a way to "replace" the first override with the second. This is a handy trick to run a test with a few 100 transactions first with one type and then replace with another derived type and run another few 100s within the same test! TIP: Look for UVM log ID "TPREGR" as shown below to ensure your replacement is guaranteed! 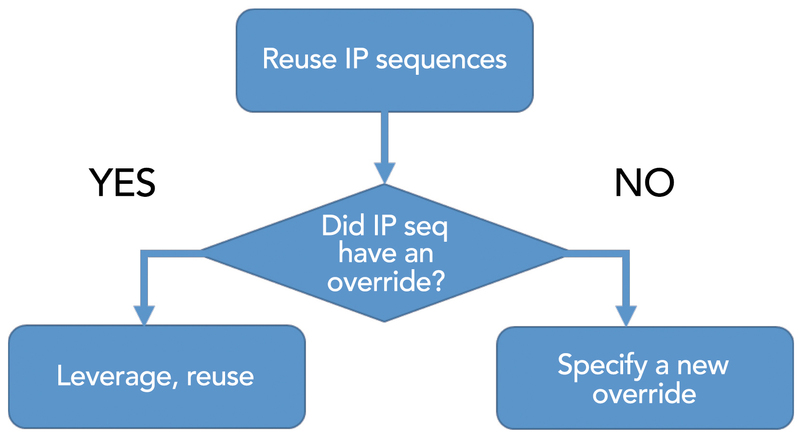 Often in a IP to sub-system reuse scenarios the subsystem engineer is not fully aware of IP level sequence functionality. It is possible that a factory override was already set by the IP level sequence. Imagine a scenario where-in a sub-system verification engineer wants to "query" the IP sequence to see if an override exists, if not, set a new override. Though SystemVerilog and UVM do not have a full-fledged "reflection API" to "query" such arbitrary questions on the database, UVM factory does support this use case via a "ignore" option to the factory override method. Refer to Figure 8 that shows a similar override as in the previous example, but setting the "replace" argument to 0. This is very useful for the reuse scenarios as described above for sub-system integrators. TIP: Look for UVM log ID "TPREGD" as shown to ensure your replacement is conditional (if no previous override, then do it!). Sometimes the user wants to "undo" an override – i.e., a base class has been overridden to be replaced with a derived class. A little later, with-in the same simulation one wants to remove/undo the override and revert back to base class. This makes sense only for transactions/sequence items as the override plays a role only when the create() gets called AFTER the override setting. Another scenario when "undo" operation is desired is when a IP is being reused at the next level and the integrator wants to nullify the override set by the IP. While the above code will work fine with the latest UVM 1.2 release, in case of UVM 1.1d (which is more prevalent at many customer designs as of today), the above code will lead to an error as shown below in Figure 11. A work-around for achieving the same in UVM 1.1d version could be to derive a dummy, new class from the base class and use it. The new class that is derived should contain no extra code and is intended to just fool the compiler to treat it as a derived type, but functionally same as the base type. Figure 12 shows a possible s2p_undo_xactn UML diagram to explain this. A code snippet of internal implementation of UVM factory is shown in Figure 13 below. A sample print from Questa® simulation with the above debug code is shown below in Figure 15. Note that we used all_types (0) to see only relevant information. TIP: Use uvm_factory::print(.all_types(0)) – it is built to show the overrides alone. In UVM components are built hierarchically and hooked up at the top level. The hook-up happens through 2 key fields – name and parent. Every UVM component in user code implements new() as shown below in Figure 16. For the first-timer the above code looks a bit strange, but since the base class (uvm_component to be precise) requires these 2 arguments, it becomes important to stick to this style (though technically speaking there are other crude ways with default values, etc.). The parent argument in the component's constructor is expected to be connected to the "testbench" parent component (and not necessarily a standard OOP parent class). A typical hierarchy/topology of a UVM testbench looks as shown in Figure 17. 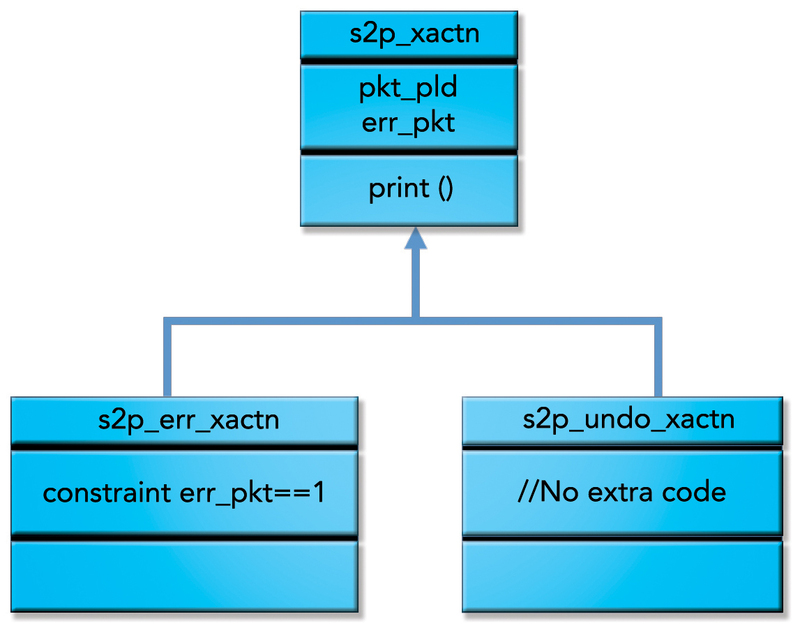 The standard UVM print_topology prints in a tree format as shown below and every "indentation" level indicates a layer in the testbench. For instance, driver is indented inside agent. It indicates that driver's parent argument is connected to the agent object. Keep sensible names – will see why below. For simplicity, let's consider a case where-in we change the name to be different than the handle. Figure 18 shows an AXI fabric UVM setup. The environment is instantiated with a handle named axi_fabric_env_0. 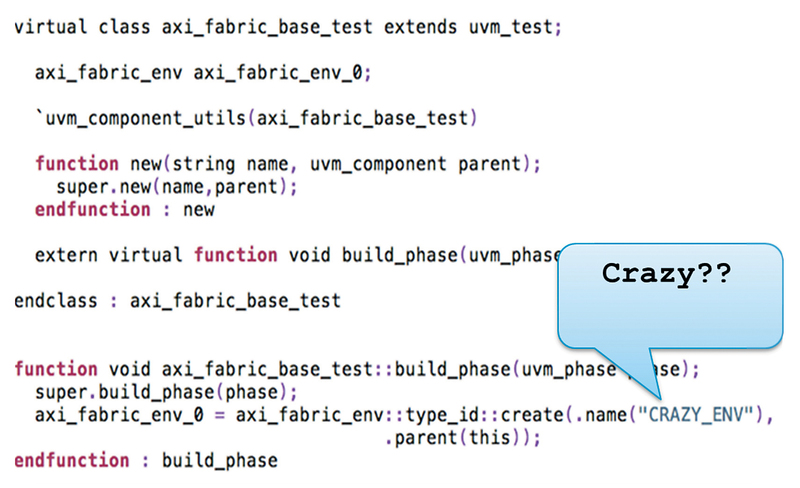 In the build_phase the environment is constructed using factory's create() – but for experimentation sake the name has been changed to CRAZY_ENV. This directly impacts the hierarchical name of this component and all underneath (as the path has a different name). Fast-forward, consider a test writer setting an instance based factory override for the sequence item within this env-agent-sequencer. Refer to Figure 19 with an attempt to override via instance specific API. While the above code shall compile, run, it will not produce the intended overrides! The reason being that the name of the environment with the handle axi_fabric_env_0 has been set to CRAZY_ENV during the build phase (Refer to Figure 18). 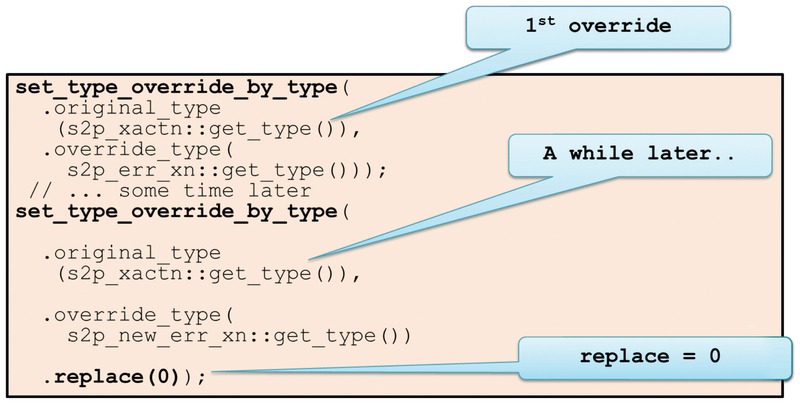 Figure 20 shows the correct way to get the instance specific override working in this case. Please note that this is an experimental example to demonstrate the impact of name argument in UVM and the authors do NOT recommend this unless it is really necessary. TIP: In case of instance specific overrides, the "instance path" is important and recall that it uses the "name" of the object than the name of the handle! TIP: Use get_full_name in case the instance path is not clear. UVM is a very powerful methodology. Since it is well structured, generation of standard UVM framework as a starting point is quite common practice. Such simple automation brings productivity to the teams. Debugging UVM issues can become tricky and painful if users are not fully aware of many of the built-in debug hooks in the base class library of UVM. In this article the authors shared some of the time tested tips with respect to UVM factory. All the tips mentioned are tool and vendor independent and comes for free with UVM. Readers are encouraged to see the references section to learn more such tips and tricks.